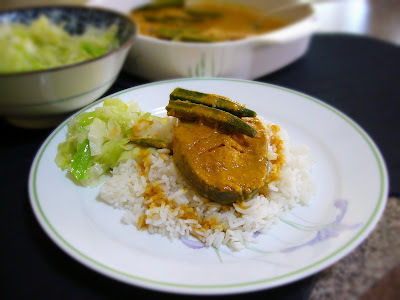 This is a quick version fish curry... my 2nd sister's curry is excellent!!! 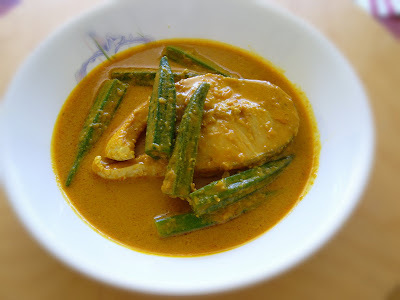 Will try to get her recipe... She uses fresh spice... 'rempah giling'. Hmmm ... it gives an authentic Northern curry flavour.. Blend the onion and garlic. ground the cumin. With 2 tablespoon of canola oil, saute the grounded cumin and blended onion/garlic until golden brown. Add curry leaves and the black mustard seeds. Stir then add curry paste with tamarind juice. Cook until the mixture thickened. Add vegetables. Add fish last and coconut milk....season with salt and leave it to boil...turn off the heat.